Yup. The Registered Dietitian and Personal trainer did not successfully complete the Whole30. What happened, you ask? Well, firstly, I am a curious human. During the last week of my Whole30, some friends had a really good ale and very interesting corn chips from Whole Foods. And I tasted them! I WANTED to. I only had a small amount that night, so I really didn't think it was a big deal. I was going to keep moving on without any remorse. I got my tattoo. On August 29, the second to last day, my side was drilled for 2 straight hours. It was pretty painful, I am not going to lie-- it hurt. After an almost 100% clean Whole30, I went home that night and ate half a pint of Thrifty's Animal Cookie Ice Cream (shoutout to my mom for having two of my favorite things in the house when I am on the final stretch of my diet). I just wanted it. I didn't care. It wasn't like a post-workout need for food... I am not sure what it was, but alas, I sat there at 10pm that night and ate something that had dairy, gluten, soy and a heck of a lot of added sugar. So was I going to do this all over again? I told myself, no. Since I pretty much blew all of my introduction phase out the window, I just decided to return to a "everything in moderation" diet this week. BUT, let me tell you -- something is not right. During my Whole30, I felt my gut was finally "clean;" I was having textbook digestive patterns, and I never felt weighted down. However, this week, I am having a pretty bad digestive relapse. I am not sure what it is from since I have had gluten and dairy (probably the two things I was most concerned about) this week. My tummy is definitely not happy. I am not sure what to do at this point, except trying an elimination diet that isn't so strict/all-inclusive. I can continue provide updates every once in a while, maybe I will try this Whole30 thing again later on in the year. But comment below, let me know what you think! About 3/4 of the way through! I found out this week that I can do scorpions and long arm hangs (still room for improvement but I am proud of where I am). Our summer show was this weekend and I had a blast. I love my aerial family! They are all amazing, supportive people who have helped me grow as a performer and a person. 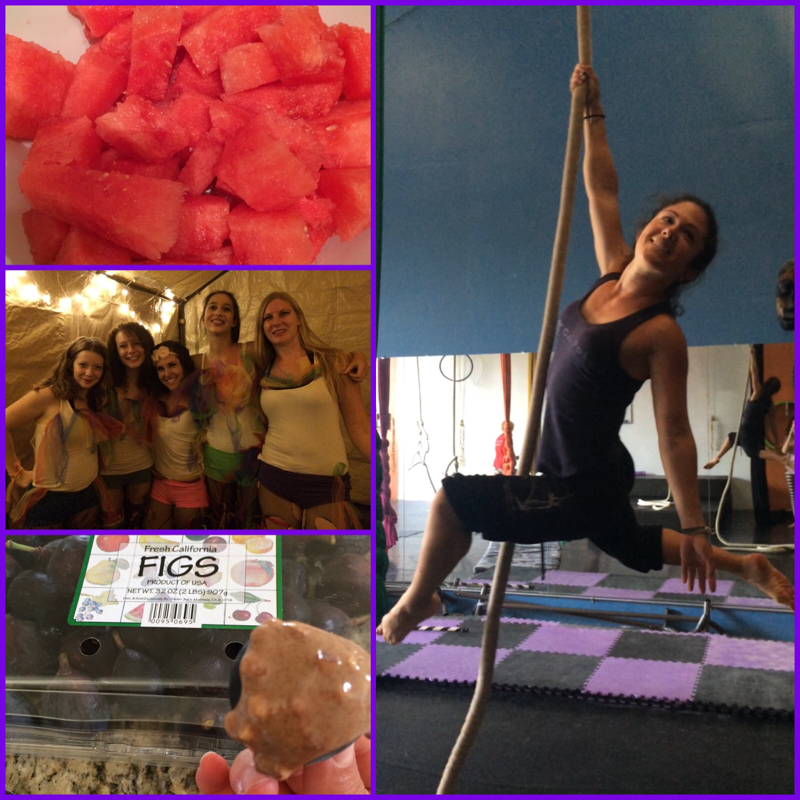 Watermelon obsession and figs with crunchy almond butter!!! We got our CSA box again this week, full of leafy greens, peppers, pluots and corn (which I am not able to consume). But I am really loving this system! Also- I attempted to make my own mayonnaise. Horrible idea. Major fail. I don&apos;t even like mayo but this Whole30 website is a mental ninja! After reading an article about homemade mayo I was convinced it was going to change my life. Not the case. That was a lot of eggs and oil down the drain. I admit I didn&apos;t make it 100% the way they recommended but still-- it was bad. Hopefully someone reading has better experience but I will continue my life with NOT eating any mayo. 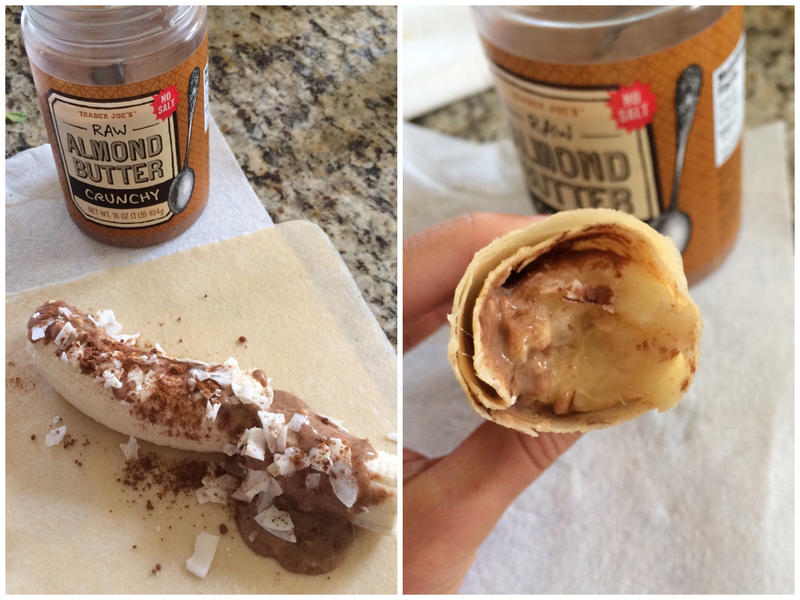 Banana and almond butter roll up with flaked coconut!!! We shall see what food adventures the next week brings me! Watch my pieces on my Facebook page ! ....whoooooa, livin on a pear! Halfway through my Whole 30! Well, I am eating way more than just pears ;-) but I couldn't resist the Bon Jovi reference. Thus far, I am still feeling very strong, my bloating has dissipated, and I have lost nearly all of my sugar cravings. I have found some products that are Whole 30 compliant, but I have to admit, they are all very expensive. So, the seltzer water (~$1/can) at Trader Joe's is amazing! Very refreshing, I love it. The cashew milk I found at Whole Foods (~$7 for 3.5 cups) and you have you have to be careful with which one you choose because the Unsweetened Cashewmilk has vanilla extract in it, which is technically not compliant with the Whole 30 (vanilla extract contains alcohol); but the one shown above is sweetened with dates...... SO it is technically compliant, but the Whole 30 police may not appreciate it..... I used it in my Chameleon Cold-Brew Coffee concentrate (which is DELICIOUS by the way- ~$10 at Target or ~$11 at Whole Foods). The Paleo wraps are very thin tortilla-like wraps that are made with coconut meat. They were ~$11 for 7 wraps at Whole Foods. 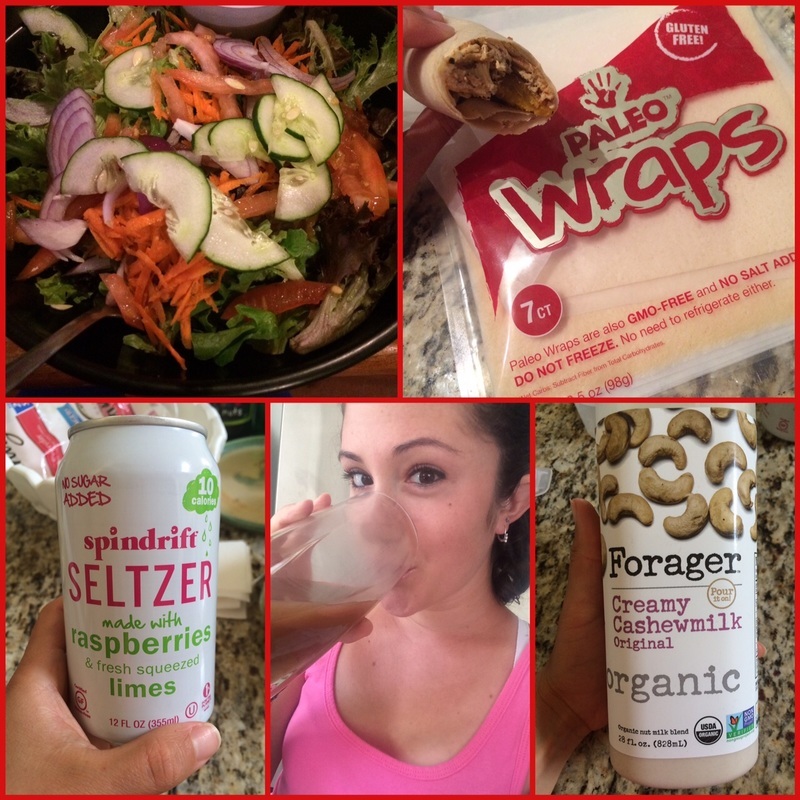 I liked them a lot, but those wraps and my Coconut Aminos (not pictured-- sorry!) actually taste sweet to me. I made chicken wraps but I feel like the Paleo wraps would be great for almond butter and some strawberries. Also pictured above was a simple green salad I ordered at Laguna Grill when I went out with friends the other night. 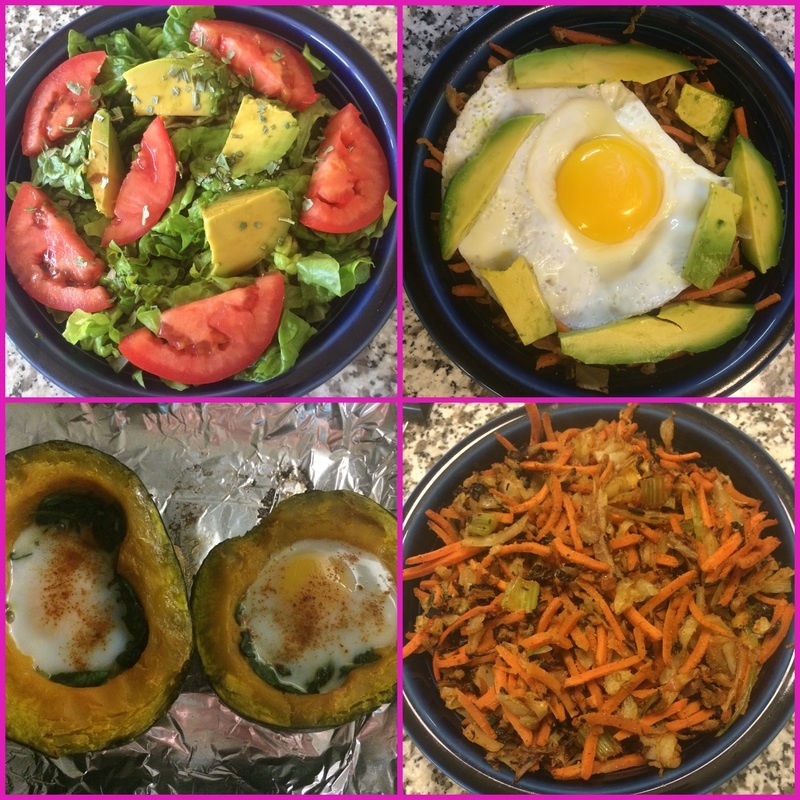 It is possible to eat out during your Whole 30! Pictured below is some grilled chicken with a spicy mustard sauce I made (leftovers were shredded and made into a wrap for the next day). I also got tri-color carrots and green and purple asparagus and roasted them up with some garlic. Really delish--but also smelly! And of course I had to add in some of my circus shenanigans! ...by questioning, we arrive at the truth (quote by Pierre Abelard, French philosopher). Bananas, almond butter, and sweet potatoes are my BFFs! I thought this quotation was applicable to my Whole30 journey, as I began with doubt, questioned, and am currently in the process of discovering the "truth" (at least for my body). I may have a slight cold/allergies, but I am have not felt any bloating for a few days now. I am also feeling more energized when I wake up in the morning, but I think it is still too early in the game to attribute this to the Whole30. to any "forbidden" foods. I have mostly been making food at home, but I also needed to have my sushi fix (without rice, of course). I found a naruto roll (fresh fish wrapped in cucumber) and really yummy fresh sashimi up in the Bay Area. There are so many possibilities and combinations for just a few ingredients. 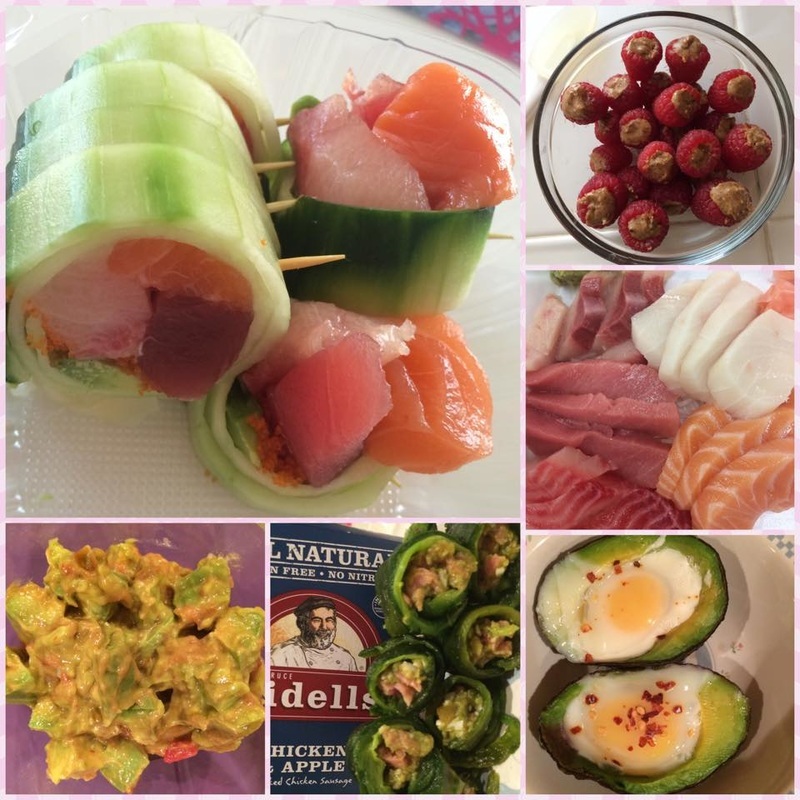 It helps to not get bored of the same things every day-- trying new flavors or twists on recipes has been really fun! Let me know if you want any recipes :-) I will share if people show interest. I have found, however, that it is difficult to find any type of packaged item that is compliant with the Whole30. For example, roasted cashews (compliant on their own) may be made with peanut oil, most jerkys are made with sugar and dried fruits contain sulfites. These are all great items that I may recommend to clients as "emergency" or "on-the-go" foods, but they are not allowed during this Whole30. Just something to think about. **For any one who does not know what a CSA box is-- it is a "farm share" box of vegetables that you can either pick up or get delivered to your house weekly or bi-weekly. You pay by month and every box has fruits and vegetables that are mostly organic and local. Do a google search to find CSA distributions in your area! I have found it tremendously helpful to always have the option of fresh fruits and veggies to snack on. 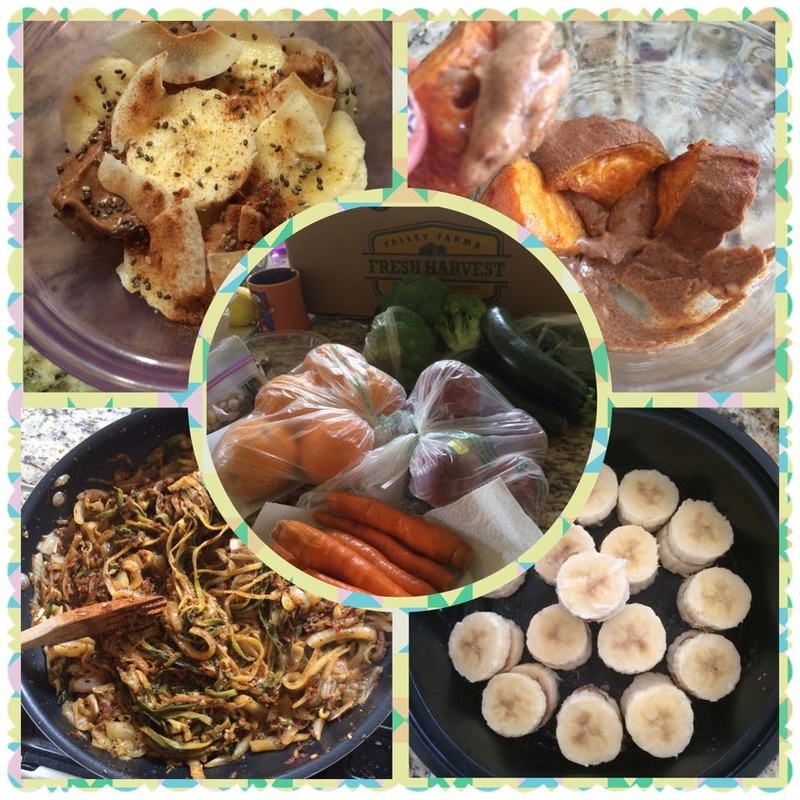 I get the box and prep the items for the week so they are ready for when I need them! So far so good-- here are some photos of the things I made yesterday/today. I LOVE Kabocha squash! I may be dramatizing--my diet was never truly horrific, but I did feel like I could have been a better example. So, now that my less-than-perfect eating habits are out on the table, let me explain why I am going to begin a program that most people in my field would consider a "fad diet." Fad diets that eliminate entire food groups are "no-nos"
The Whole30 program is a 30-day "metabolic reset" where all grains (including the gluten-free varieties such as quinoa and even corn), dairy of all kinds, sugar (natural, artificial and sugar alcohols), alcohol, soy, legumes, carrageenan, MSG and sulfites are prohibited. Oh, and no re-creating "junk" food with approved ingredients. And if you slip up ("cheat"), EVEN JUST A LITTLE, you have to start over. Once your 30-days are up, you can start re-introducing these "inflammatory" foods. Whoa. How do I even start? I had so many concerns with these restrictions. First of all, NONE of the creators of this program were Registered Dietitians--although some had backgrounds in related fields (of course I am biased toward my own profession and didn't appreciate the lack of representation). I felt like this would completely take away from the enjoyment of eating. I mean, sugar as a minor ingredient in my mustard is not going to kill me. And carrageenan is a thickener derived from seaweed with no scientifically-proven negative side effects. And since when does oatmeal cause hormonal imbalances (another claim of this program)? These self-proclaimed nutrition professionals say that eliminating all of this food is going to improve my energy and bloating? Where is your research? I wanted to see the science. I know how to eat. I have studied nutrition and metabolism for 5 years--I know how to work around the restricted foods to compensate for the fiber from grains and calcium from dairy. I will ensure I get my micronutrients. Plus--contrary to some of those opposed to the Whole30--you are NOT going to become chronically nutrient deficient on this diet. 80% of your intake will be fruits and vegetables, come on. My gut microbiota is probably effed up. Even if this Whole30 is not what it's cracked up to be, I know I will get some benefit out of it solely by ditching the sugar. As I mentioned before, on days that I didn't have time to eat, I would only eat baked goods that I made myself on weekends. Even if it was made with pure maple, honey or stevia, it's still sweet. And there IS scientific evidence on gut microflora and sugar. Basically, the more sugar you consume, the more that microflora in your intestine crave it. The bacteria in your gut can actually send signals to your brain telling you that you need more sweetness. I am dead serious. I am aware of the placebo effect. Duh. But hey, if I feel better, who cares if my hormone signaling, inflammation or gut microbiota actually changed? I want to appreciate my food. I need to stop mindlessly eating. Some of the hype from the Whole30 may be pseudoscience, but there are also some legitimate points. I believe the WAY we eat outweighs (you see what I did there?) some of what we are eating. A splash of whole milk in my half cup of oatmeal in the morning may not cause hormonal chaos, but I am curious to see how my body responds to complete elimination for 1 month. To keep tracking easy, my Whole30 will be August 1-30th. Being "fun sized" myself, I want to keep my blog posts short and sweet. I'll try. But first, I would like to share my background and why I decided to start this blog-- which I may turn into a vlog, we'll see. I went to Cal Poly to study nutrition, and little known fact, it is not uncommon for those who come into the dietetics field to have a history (or some form) of disordered eating habits. 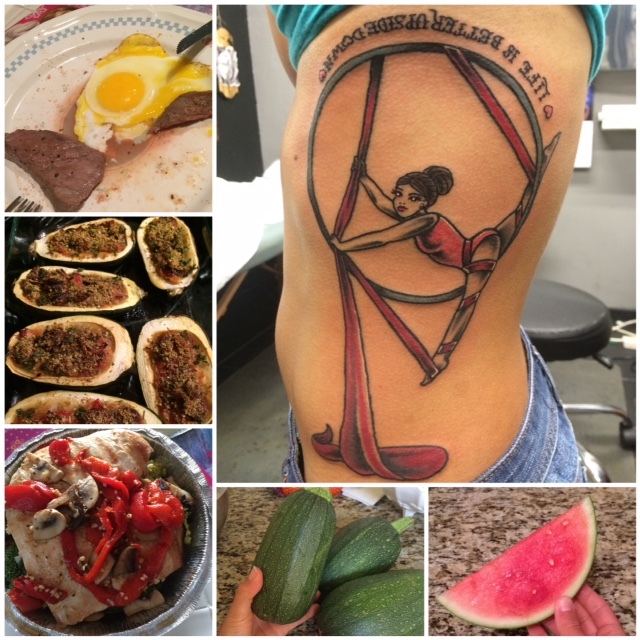 I have a background of dance, gymnastics and cheerleading, all of which revolve around body aesthetics; although I did not fall into a full-blown eating disorder, when I was in high school, I did not have a healthy relationship with food or my body. Things improved during college and I accepted the natural weight gain that occurred--even still, I was amenorrheic until I was 21. I am 5'0", so 10 pounds is significant for my body type, but I knew I needed to have more "meat" on my body than I had during high school. I was finally at a healthy weight and following my hunger cues. I ran 3-4 times per week and participated in fitness classes before going on to get my own certifications to teach them. After graduating, I began my dietetic internship: a one year, full-time internship, with no stipend that cost me $15,000. Needless to say, I was stressed out. A lot. I started running even more for relief and to clear my mind--8 to 10 miles a day--on top of teaching fitness classes before work. I was going on 5 years of studying nutrition but ironically, the stress of it all prevented me from practicing what I preached. My diet was not all that people thought it was. I felt pressure from everyone telling me how great I ate, when in reality I was falling back into poor eating habits. I knew what I should be doing; I knew what was "right," but I was not able to follow it. 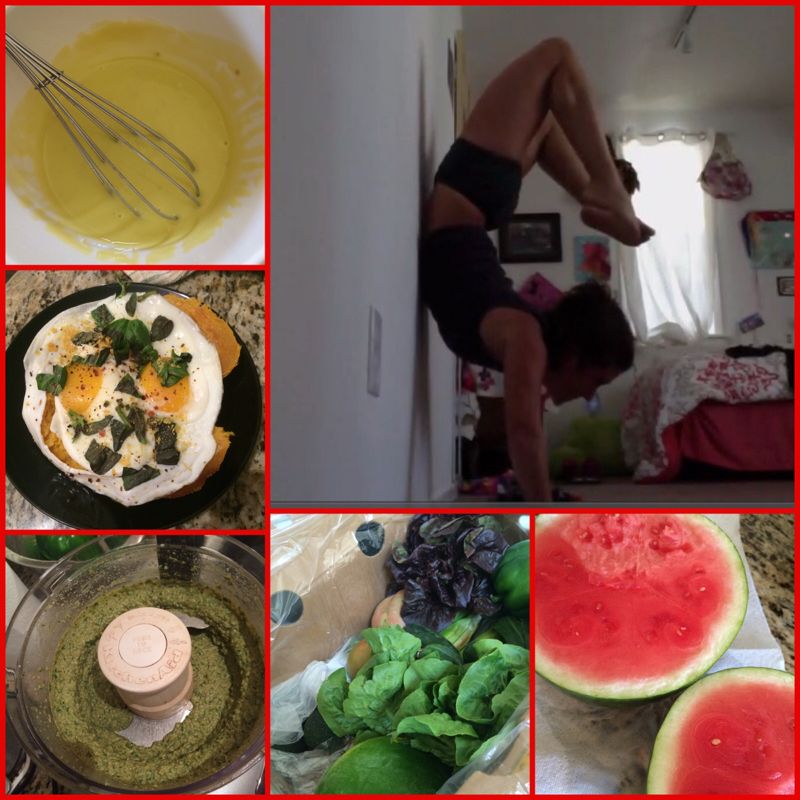 I was so busy during the day--sometimes I would go the entire day without eating and at night binge on protein brownies and energy bites that I would make on the weekends. Those late-night indulgences perpetuated a vicious cycle of my daily eating routines. And I wasn't paying attention to my body; I had probably gained weight, but my clothes still fit, and I was too intimidated by the scale to ever check. Then, I found an aerial arts studio tucked away on a backstreet behind Trader Joe's, and I truly found my sanctuary. This was a place where I could go to climb and play in the air--where all my worries of the work day were obliterated. 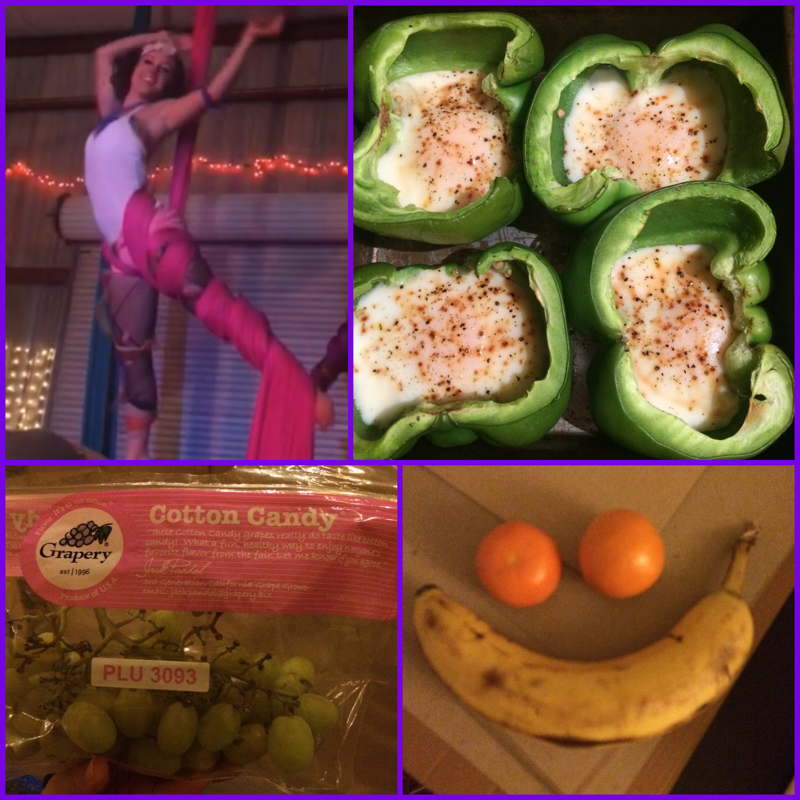 It was only after beginning my aerial arts that I really started to feel the impact of what I was (and what I wasn't) eating; I had stopped feeling those normal hunger cues and was not in-sync with my body. Energy and nutrition is so important when you are literally holding on for your life. I knew had to change my habits if I wanted to grow as an aerialist. And although I am far from perfect, things are improving. My body is more toned than it ever was before and I feel so much stronger. 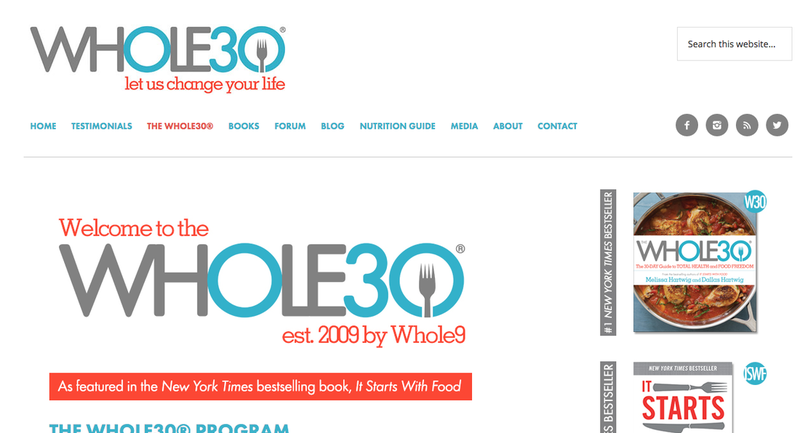 With this I will lead you into my next post: The Whole30 and why I am doing it. Stay tuned! 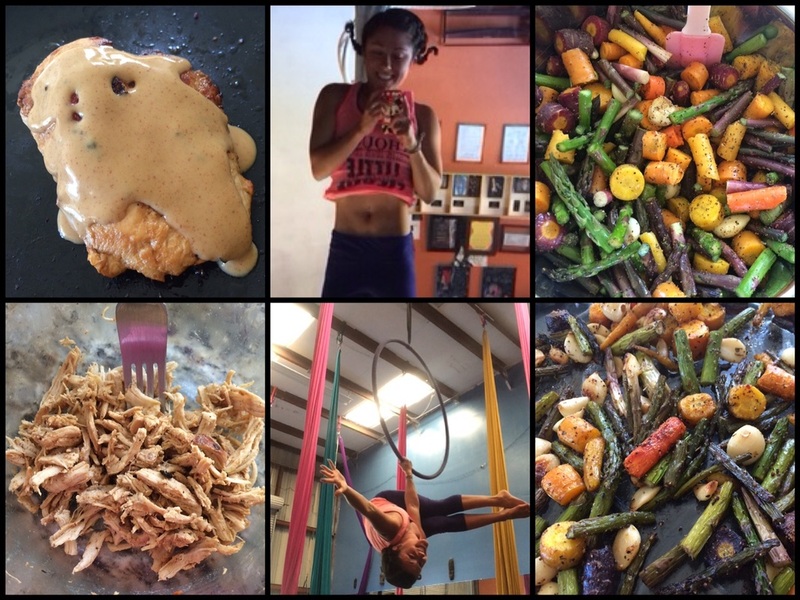 ACSM Certified Personal trainer, Registered Dietitian and aerial artist trying to find balance in food and fitness.